Sean Astin hammed it up with the boys prior to the start of Friday's game in Phoenix. Photo above via @Dodgers on twitter. Honest question. Did Puig even know who he was? It's been 12 years since Astin played Samwise Gamgee in the Lord of the Rings trilogy, so I don't think he would have ever seen the film while he was still in Cuba. (Forgive me for my ignorance, but would a common Cuban be familiar with modern Hollywood films?) 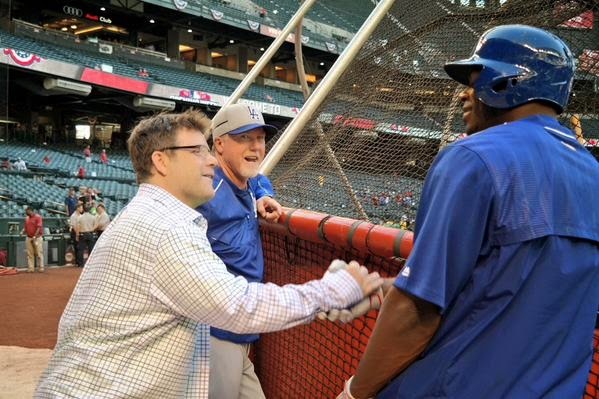 I understand that Sean Astin is a Dodger fan, so no doubt he's probably met Puig before yesterday (I would assume). Still, I do wonder how much of the American/Western culture Puig knew before coming here. Via Cory DiBenedetto at the Daily Gammons, "Adrian Gonzalez is on fire: In-depth look at his incredible start." Via Alec Dopp at the Daily Gammons, "How Legit are Joc Pederson’s Swing-and-Miss Tendencies?" Clearly, swinging and missing has been a problem for Pederson, even when he tore through Pacific Coast League pitching throughout the 2014 minor league season. His 13.5% swinging strike rate — calculated as whiffs divided by pitches seen — is nearly identical to that which he’s posted thus far in his big league career. He’s swinging about five percent less often and seeing more pitches since his promotion, which at the very least shows us he’s been selective, even sans chase rate in those minor league scoreboards I sifted through. But even so, while Pederson seems to be a patient hitter, he’s making less contact when he does swing, which is particularly concerning by my estimation. Via Rob Neyer at Just a Bit Outside, "Has Newk been cheated by the Coop?" Neyer takes a look at whether Newcombe was an Hall of Famer. Check out some great photos from Opening Day game of the Tulsa Drillers (our AA affiliate) taken by Reddit u/kittysparkles here. Via David Hood at True Blue LA, "Chris Anderson, Corey Seager stand out in Dodgers Tulsa debut." The clothing brand that began as an anti-McCourt parody line called Frankrupt has re-launched with a new line of Dodger-fan themed tee shirts. Check them out here. Check out a funny photo of one of their T's on the right. 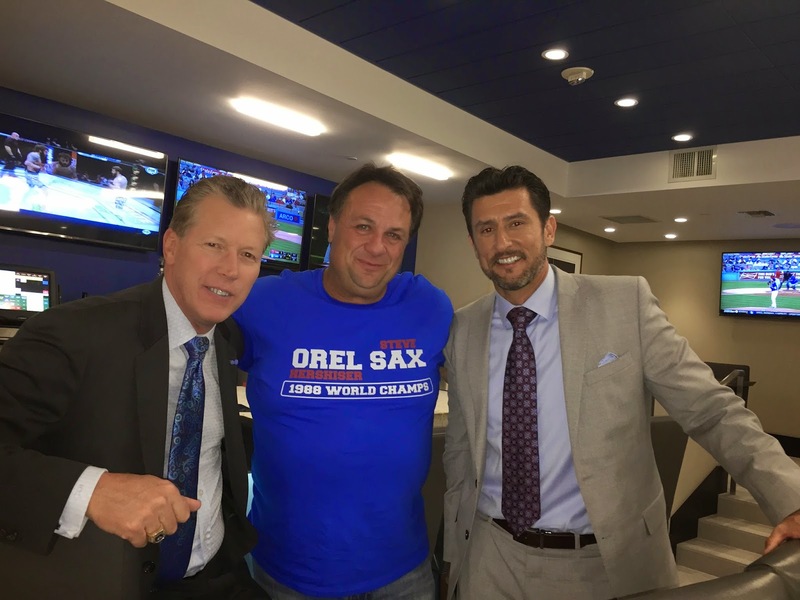 It's called "Orel Sax 1988 World Champs." Click on the pic to embiggen. The videos below is a part of MLB's new “THIS” campaign and it features Yasiel Puig and several other Dodgers. Below Yasiel Puig puts on his Latin shoes with some fellow DodgerBros as Clayton Kershaw looks on. The ever playful Puig goofs around with Uribe and Ryu.